Who like’s driving around in their car blowing up everything in their path? The folks at NetDevil of course! They’ve put all that excitement into their upcoming MMOG, Auto Assault. We ask the questions, so you don’t have to, so check it out! Auto Assault is a game that personally has interested me since I first found out about it. 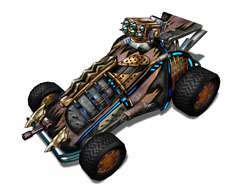 The idea of combining vehicular combat, along with normal Role Playing elements sounded so unique to me, and I thought it would be a blast to play. Netdevil’s other MMOG, Jumpgate, proves that they already know a thing or to about massively multiplayer online games. NC Soft is publishing the game, and they have pumped out such hits as Lineage II, City of Heroes and have a few upcoming MMORPG’s as well. We had the great chance of talking to NetDevil to find out more about this very cool MMOG. Let’s get on with the questions! Techgage: Obviously, this is a new type of MMO we’ve never seen before. So firstly, what’s the game about, and how did the idea for this type of game arise? NetDevil: Auto Assault is an idea that we at NetDevil have had for a long time. In fact, when coming up with ideas for a game it came down to doing either a space game or a car game. We did space first with Jumpgate and are now putting the finishing touches to our car combat project, Auto Assault. 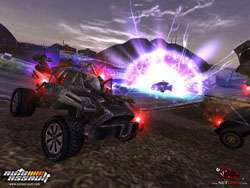 Auto Assault is a high action MMORPG. You must combine your character’s abilities with your vehicle’s statistics (weaponry, armor and so on) to destroy enemies, other players and even the actual game world if you can see it, you can usually blow it up!. We wanted a game that had all the fun of action games, specifically including vehicles and the afore-mentioned blowing everything up, with the long-term enjoyment of persistent world online games. TG: Other than the game being centered around vehicular combat, what other aspects of the game separate it from other MMOs? 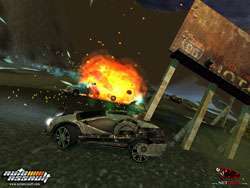 ND: The biggest difference that separates Auto Assault from its MMO predecessors is the inclusion of a physics engine into both the client and the server so that nearly everything in the game world is destructible. From the very beginning, we have aspired to create a game that supports truly physical environments. This has led to some difficult and trying development quandaries to resolve but the results have been amazing and we’re certain that we’ve created something that players will have never experienced before in a MMO. TG: What is the character creation and customization like? How many different combinations are possible? City of Heroes impressed us with the vast amount of configuration… will Auto Assault be similar? ND: Although most of your time in Auto Assault will be spent inside one of your vehicles, we wanted to include robust character (avatar) customization. There are multiple combinations that allow for a unique character, so that you’ll easily be recognized when on foot in one of the game’s towns or cities. Most character tweaking takes place in the head and shoulder area, since this will be the part of you that other players in your group (or ‘Convoy’ in Auto Assault) will see as a character portrait. Then of course, there’s vehicle customization. This is where we really went to town, since again this is where you’ll be during most of the game, so your vehicle represents who you are. There are many visual options for your vehicles, including ‘Tricks’ (external embellishments like fins and cattle guards), ‘Trims’ (unique paint combinations and details,) and weapons, wheels and so on picked up as loot or earned as quest items. There will be a ton of ways to visually convey your in-game persona and stand out from the crowd. TG: More on the characters you create.. how will the progression work? Is the game based on levels, like most MMOs? Or will it be purely based on increasing your stats? ND: Character progression is made by gaining levels. As you gain a level, you get points you can spend for both attributes and skills. Vehicle progression is through drops, stores and missions. The combat abilities you have in the world are a mixture of the character and the vehicle. TG: What will the leveling grind be like? Will the leveling system in the game be faster than most others, or will it take you countless hours to gain a level or stats? ND: Our primary design mantra is to make the game fun. We are striving to make a game where you level while playing instead of playing to level. What we mean by this is that your goals should be wrapping up a story arc or looking for a new item, not watching the XP bar and doing the math after each kill to determine how long it is until you level again. To facilitate this, we have designed the game in such a way that the majority of your experience will come from completing missions as opposed to destroying mobs. TG: What will the ingame economy be like? Will you gain money off enemies you defeat? Do you expect crafting will become a great part of the economy? ND: The enemies you fight will drop items, resources, and in-game currency. (In Auto Assault, our currency is called clink.) Mission rewards offer items and clink, too. Players will be able to buy, sell and trade items and commodities. We expect that crafting will be a big part of the game as both a way to get better equipment and a way to make money.